Common Name: Hematite, Red ochre. The hematite mineral is dug and smashed into small pieces or ground into powder. The mineral hematite consists mainly of Fe2O3. Mined in the provinces of Shan Xi, He Bei, He. Nan, and Shan Dong, the ore is broken into pieces before use. Functions: 1. To pacify the liver and subdue the yang; 2. To conduct rebellious qi downward and stop vomiting; 3. To stop bleeding. 1. Deficient yin of the liver and kidneys and hyperactivity of liver yang manifested as distension and pain in the head and eyes, dizziness and vertigo. Red ochre (Daizheshi) is used with Dragon's bone (Longgu), Oyster shell (Muli), White peony root (Baishao), Tortoise plastron (Guiban) and Cyathula root (Niuxi) in the formula Zhengan Xifeng Tang. 2. Rebellious stomach qi manifested as vomiting and belching. Red ochre (Daizheshi) is used with Inula flower (Xuanfuhua), Fresh ginger (Shengjiang) and Pinellia tuber (Banxia) in the formula Xuanfu Daizhe Tang. 3. Extravasation of blood by heat manifested as vomiting with blood and epistaxis. Red ochre (Daizheshi) is used with White peony root (Baishao), Bamboo shavings (Zhuru) and Arctium fruit (Niubangzi) in the formula Hanjiang Tang. 4. Asthma due to deficiency of the lung and kidneys. 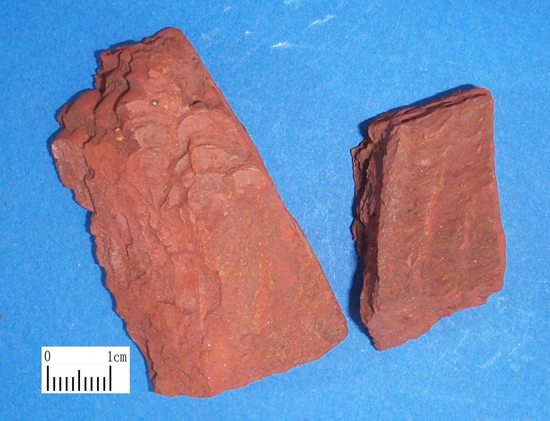 Red ochre (Daizheshi) is used with Ginseng (Renshen) and Dogwood fruit (Shanzhuyu). 5. Chronic uterine bleeding manifested as dizziness and blurred vision due to deficient blood. Red ochre (Daizheshi) is used with Limonite (Yuyuliang), Red halloysite (Chishizhi), Frankincense (Ruxiang) and Myrrh (Moyao) in the formula Zhenling Dan.